It is quite easy to identify the Islamophobia of Donald Trump and many on the right. The “Muslim Ban,” manufactured rage about sharia law, Muslim registries… these things are quite simple to get worked up about. Civil rights organizations, Muslim and non-Muslim alike, rightly point these things out and criticize them roundly. But these things are not our main problem. We can build coalitions against such in-your-face bigotry (one of the positive offshoots of Trump, if I’m looking for any). Countering blatant Islamophobia is necessary. But it is not a brave exercise. The challenge is how to deal with the latent sort, the brand of Islamophobia that cloaks itself in liberalism. We all remember Hillary Clinton pronouncing in presidential debates that we need “to work with American Muslim communities who are on the front lines to identify and prevent attacks.” She went further, telling us that “we need American Muslims to be part of our eyes and ears on our front lines.” Her liberal framing of Muslims solely in terms of national security and their usefulness in the fight against “terrorism” is in many ways more dangerous than blatant Trumpian Islamophobia, mainly because it is more difficult to identify, while being just as treacherous. We all remember Clint Eastwood’s widely lauded “American Sniper,” a film that basically consisted of a white American serviceman shooting Muslims for two hours. It was our country’s highest grossing film of 2014 to the tune of $350 million. The main character’s moral crisis was when he labored over whether or not to shoot a child (spoiler alert: he did). It was nominated for five Oscars and celebrated by the American left. 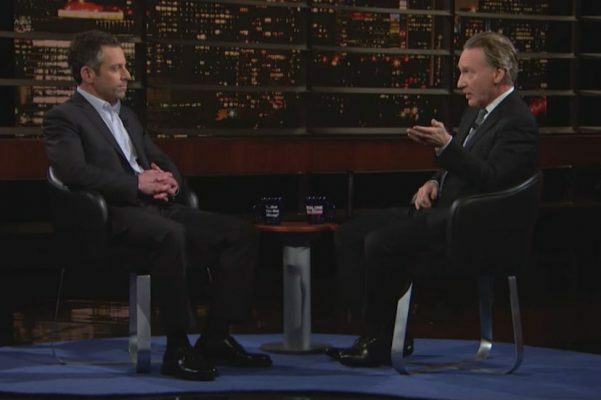 Sam Harris and Bill Maher serve as the intellectual, pop-culture kings of this liberal strand of Islamophobia. Last Friday, Harris sat down with Maher to discuss jihadism, Islamism, terrorism, and all things related. Harris started out with, “We have to win a war of ideas with the Muslim world.” This is the go-to mantra of those who believe in the tired idea of a “clash of civilizations.” In other words, that Islam is, per se, incompatible with “Western”/American life. Guys, by the way, this “clash of civilizations” stuff is so dated. Anyone who still talks in those terms might as well be wearing an Ed Hardy t-shirt. Harris went to say that Muslim world needs to rid itself of the stain of extremism, and that “only secular, liberal, and former Muslims can police this for us.” In other words, only Muslims far from anything traditional, or better yet those who have rejected the faith altogether, can save Islam. “For us,” of course. He used the way-out-of-style catchphrase “moderate Muslims.” “We need to reach out to them.” Maher, of course, ate it all up, adding, “We are never going to defeat terrorism is we don’t reform Islam.” He added his own colorful analysis of Muslim societies, with some really insightful commentary on female Islamic wear, telling us that “Muslims blame women for men’s horniness.” Of course, patriarchy and misogyny are not the exclusive domains of any one society, and they are surely not foreign to America. Brock Turner, anyone? Let me talk about this “moderate Muslims” trope for a second. There is never any recognition by anyone who uses it that “moderate Muslim” means something totally different to a Muslim than it does to Harris and Maher. In fact, the “moderate Muslims” Harris is attempting to refer to (I think), namely activists, intellectuals, opposition figures, secularists, don’t use the term at all. Except Harris uses the term, he invokes people like Ayaan Hirsi Ali, individuals who have rejected the faith and culture altogether. Ultimately, what Harris and Maher are saying is that the problem with the Muslim world is, simply, Islam. This is reductionist, undeveloped, and just plain stupid. It demonstrates a blatant ignorance of any history of Islam or the Arab world. And this should not be surprising, as neither has any advanced degrees in the area. Harris is a neuroscientist, and Maher is Maher. They are not not scholars of the subject, self-taught or otherwise. And it shows. Maher’s simplistic discussions of the hijab and Harris’ facile paradigm of Muslims as jihadists, Islamists, and conservatives display a juvenile misunderstanding of Muslims and their sensibilities. But what’s most damaging is that these two are celebrated as sophisticated, enlightened commentators, as liberal critics of Islam. Hey guys, I like my whiskey. I eat bacon sometimes (I’m American, after all). A sheikh would not approve of many of my lifestyle choices. I can diagnose all the individual ills of the Arab/Muslim world that you can. I see the need for reform. I hate ISIS (I thought I would just say that for the record). I see myself as part of the greater Muslim fabric. I’m a secular liberalist who dislikes religion in governance. But I can never get on board on with you. As long as you continue to assert that the problem with my homeland is my heritage itself, you’re just blowing hot air. When it comes to talking about Islam or the Arab world, it’s amateur hour with you two. It’s almost as if you’ve never read reformers like Ali Shariati, Fatima Mernissi, and the like, who have invoked the egalitarian traditions of Arab and Muslim societies as the way forward. To paraphrase Bill Clinton, I believe that there is nothing wrong with my people that cannot be fixed by what’s right with my people. And I’m not alone. So, if your objective is to get leftie Arabs like me on your side, you’re failing terribly. If your goal is to talk about about my people in no more advanced terms than Donald Trump, then you’re doing a great job. Great analysis of a typical anti-Islam Maher segment! Maher clearly hates every religion but doesn’t dare to attack mainstream Christianity or – Jahwe forbid – Judaism head-on lest he be punished by the Christian and Jewish elite. Ridiculing Islam is a safe move: By attacking a religion that, although being based on the Judeo-Christian principals, is vilified by both self-proclaimed defenders of Christendom and Zionist Jews alike – makes both the atheist and the “religious” lefties happy. Inviting Sam Harris who opines that “Islam is especially belligerent and inimical to the norms of civil discourse” was a logical move. I thought the conversation was pseudo-scientific, with the PhD Harris lecturing the subservient student Maher, who tried his best to occasionally throw in a smart remark to prove that his pot-smoking head was still functioning. I think Maher should stick to what he is pretty good at, which is satirical criticism of government – although I believe that other comedians have long surpassed him in cleverness and wit. But I know he just won’t be able to resist any opportunity to use his position to attack and ridicule faith in general and Islam in particular. Bill Maher is an idiot. He got popular because he said stupid things that sound intelligent and unique. I remember when you were on Bill Maher’s show, my Mom was so proud of you. Sam Harris is on point. Tell me what is the egalitarian traditions in Islam that is the way forward. the way forward is in fact less Islam. You even say you drink alcohol and eat pork, don’t you consider this rejection of Muhammad’s Islam? What else in Muhammad’s Islam you reject? looting other people with different religions? taking war slaves? Marrying 11 women? Killing critics? stonning adulteress? lashing people for drinking?etc. Religion is not your heritage, it is set of ideas, and way of life. And you are already rejecting it and moving away from it because you don’t live the way Muhammed was or follow his instructions. Sam Harris or Ayaan Hirsi Ali are saying what you already is doing by moving away from Islam and Muhammad’s commands. They are just not hypocrites. they preach what they do.